Saturday, December 8, 2018 ~ 11:00 a.m.
Lois Louise Brokaw Wacker passed from life through death into Eternal Life November 9, 2018. She was born October 26, 1932 in rural Burt County near Tekamah, Nebraska. She was the second of six children born to Charles and Ethel Brokaw. Lois was baptized at Alder Grove Methodist Church near Craig, Nebraska on June 10, 1934 and confirmed at St. Paul’s Lutheran Church, Uehling, Nebraska November 10, 1946. Lois attended elementary schools in Fremont and Hooper, Nebraska, and Junior and Senior High School in Uehling, graduating in 1950. She attended Midland College in Fremont, Nebraska and received a Teaching Certificate. She taught First Grade at Clarkson Elementary School in Fremont. On June 14, 1953 she married Alex Wacker at St. Timothy Chapel on the campus of Central Lutheran Theological Seminary in Fremont. 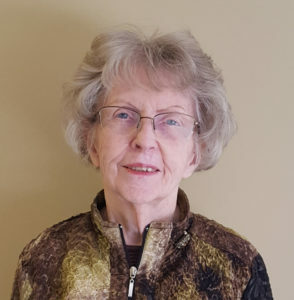 She resigned her teaching position later that summer when her husband accepted an internship position at Carthage College, Carthage, Illinois for the 1953-1954 school year. In May of 1955 she and her husband moved to Potter, Nebraska to begin their ministry at First Lutheran Church. In August of 1957 they returned to Carthage where her husband became the first full time chaplain at Carthage College. Over the years she served with her husband at Nebraska parishes in Fontanelle, Alliance, Hooper, and Lincoln. Lois was a stay at home mom and a devoted mother. She was an excellent cook and seamstress. She loved both flower and vegetable gardening and enjoyed watching birds and other wildlife. She taught Sunday School and Vacation Bible School for many years. She served as a Cub Scout Den Mother and a Campfire leader. She also served as the Director of the Lincoln Literacy Center in the early 80’s. Lois was preceded in death by her husband of 65 years, Alex; parents Charles and Ethel Brokaw, her son Jonathan, brothers-in-law Don Jennings and Don Andersen, sister-in-law Edie Brokaw, a nephew and two grand-nephews. Survivors include three daughters: Mary and husband, Dr. Jerry Seiler, Hastings, NE; Margot Wacker, Keokuk, IA; Jeanne Williams, Lawrence, KS; daughter-in-law Annette Wacker, Alexandria, MN. Ten grandchildren: Aaron and Brigitte Seiler; Nicole Gordon, David Meyer, and Katie Winder; Johanna and Daniel Lohman; Reid, Evan, and Seth Williams; six great grandchildren; brothers Ed and Roger (Kathy) Brokaw, sisters Elaine Kersten, Joyce Jennings and Patsy Andersen; sisters-in-law Ruth Migliore and Sylvia Debus; many nieces and nephews. Hugs and prayers Jeanne to you and your family as you go through this difficult journey. I’m very sorry to hear of your loss. Those of us in the “retired church worker AMAZING GRAYS” in the Lincoln area enjoyed Alex and Lois so much. Peace and comfort to all at this sad time of loss. We hope we can be at your mom’s memorial. She raised 3 awesome daughters! I sure enjoyed getting to know Alex and Lois while they were living in Ashland and worshiping at American Lutheran. We had the privilege of taking Alex to church occasionally and it became a task that we looked forward to. God’s peace and comfort Wacker family.